The San Juan Symphony, regional choirs and soloists have joined forces to present A German Requiem by Johannes Brahms in Durango and Farmington. Offering this beautiful and enormously comforting masterpiece couldn’t come at a better time. Brahms’ non-traditional interpretation of the Latin Mass for the Dead may just alleviate campaign fatigue, election anxiety and our general cultural malaise. On Saturday evening, conductor Thomas Heuser will lead a veritable phalanx of musicians in Durango’s Community Concert Hall at Fort Lewis College to perform without intermission one of the great works of symphonic and choral literature. Sunday afternoon in the Farmington’s Henderson Performance Hall, Heuser and company will repeat the concert. “When planning my first season,” Thomas Heuser said in a recent interview, “a large-scale choral collaboration was a high priority, both because of the emotional impact of the music but also because our communities have such dedicated singers and talented choirs. Brahms’ Requiem is sung in German, not Latin. The composer chose the texts from Martin Luther’s translation of the Old and New Testaments. Thematically, Brahms emphasized coming to terms with death and acceptance – not judgment and repentance. In 1865, Brahms’ mother, Johanna, died. Her death apparently spurred Brahms to complete the Requiem. Part Five, featuring a very high, delicate soprano solo, is thought to express reverence for motherly tenderness. Born in 1833, Brahms grew up in a Hamburg slum. The family of five struggled, headed by a gruff, argumentative father, a musician who played a variety of instruments and made a living working part time in beer halls, restaurants and the local opera orchestra. Brahms’ mother augmented the family’s irregular income as a seamstress. Brahms showed early musical ability and followed his father’s path of earning money by playing piano in bars and special occasions. 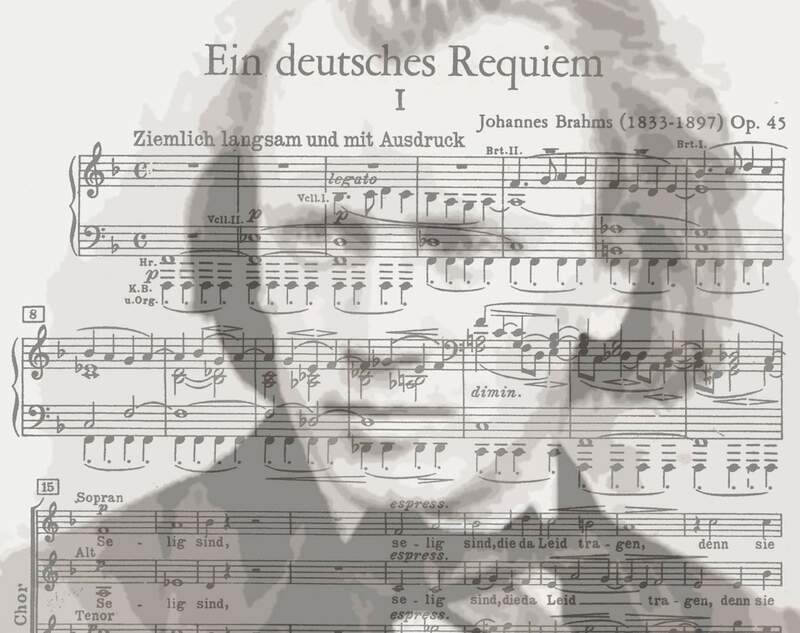 Eventually, he concentrated on composition, and his ascent as a successor to Beethoven is a remarkable story, capped along the way at age 36 when he conducted the first full performance of his requiem on Feb. 18, 1869, in Leipzig. The work is not without struggle or tension. But unlike the Latin Mass for the Dead, A German Requiem has no Dies irae, Day of Wrath. The composer allegedly said his Requiem could be called “a human requiem.” Its ecumenical spirit and overall tone of warmth doesn’t preclude strong emotion, rigorous challenge or sadness. But it overwhelmingly drives toward acceptance and reaffirmation. The upcoming performances of Brahms A German Requiem have required massive planning. Not only will the San Juan Symphony augment its ranks, but Music Director Thomas Heuser has invited regional choral groups to participate. More than 120 singers from Durango, Farmington, Telluride and Fort Lewis College will join the orchestra for final rehearsals and performances this weekend. Virginia Nickels, co-founder and director of Caliente Community Chorus, who like Chiaravalloti and Mack Berven, will be singing in the mass chorus, commented on her personal experience: “Even though I’m a decent musician, I still have to think about where I get my first note, about my sound production, about that one measure I still can’t get,” she said. For every musician on stage, the Brahms Requiem has been an opportunity not to be missed. What: The San Juan Symphony, Thomas Heuser, music director-conductor, A German Requiem, Op.45, by Johannes Brahms, with soprano Gemma Kavanagh and bass-baritone Seth Keeton, the Durango Choral Society, Caliente Community Chorus, Fort Lewis College Chamber Choir. When/Where: 7:30 p.m. Saturday, Community Concert Hall, Durango, and 3 p.m. Sunday, Henderson Performance Hall, Farmington. Tickets: Range from $16 for students to $55 for adults. More information: Call 247-7567, visit www.durangodurangoconcerts.com or call (505) 566-3430 in Farmington.